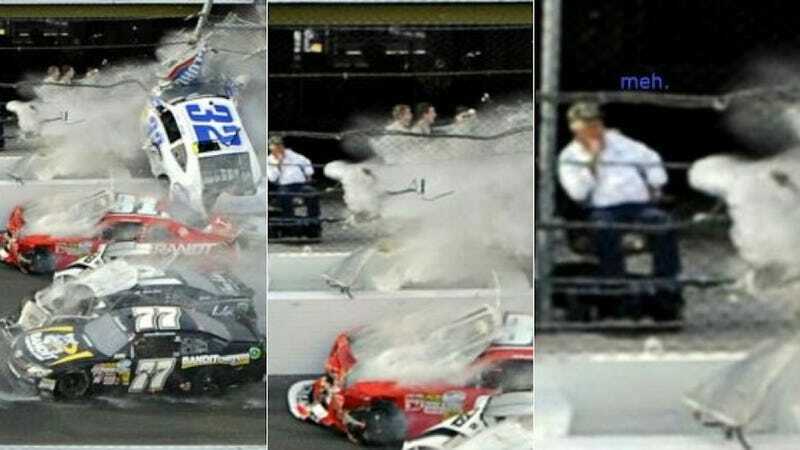 Remember that NASCAR crash at Daytona last Saturday? The one that injured 30+ fans? Well, it appears that one fan wasn't scared at all. The man, who appears to be a bit older, has probably seen a lot of accidents in his day. So the prospect of an engine flying through the fence doesn't seem to bother him. At all. Ok. Things did happen so quickly that barely anyone had time to react properly. But look at everyone else. They're running like mad to get out of the way. This man isn't one of the two people that were still in the hospital as of last Friday, so we know that he wasn't seriously injured in the incident. So maybe he has a lesson for the rest of us: In a panic situation, stay even calmer than you ever thought you could. Or take a nap.